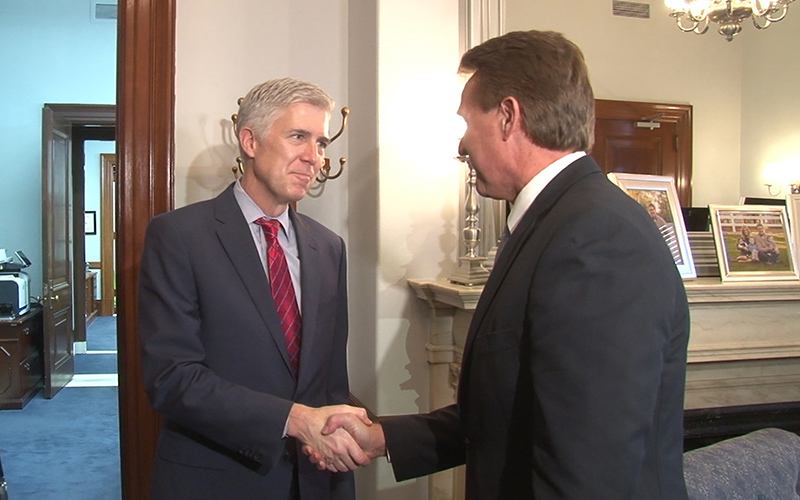 WASHINGTON – Arizona’s senators joined other Republicans – and three Democrats – in a 54-45 vote Friday confirming Neil Gorsuch’s nomination to the Supreme Court, one day after the GOP invoked the “nuclear option” to end a Democratic filibuster and allow a vote. The confirmation vote went as expected late Friday morning and came with none of the drama from less than 24 hours before, when the Senate voted to break the filibuster and clear the way for a straight up-or-down vote that required only a simple majority to pass. The vote clears the way for Gorsuch to be sworn in Monday, filling a Supreme Court seat that has been vacant since the Feb. 13, 2016, death of Justice Antonin Scalia. Sens. Jeff Flake and John McCain, who voted for Gorsuch, also voted Thursday to change Senate procedure and end Democratic debate with a simple majority instead of the 60 votes needed previously – a change both men said they supported reluctantly. The filibuster arose out of Democratic anger over GOP leaders’ refusal last year to even hold a hearing on Merrick Garland, President Barack Obama’s pick for Scalia’s seat, as well as objection to Gorsuch’s legal record. But Flake said Gorsuch, “a highly qualified nominee put forward by a recently elected president,” deserved a confirmation vote. “While changing Senate rules was not my preferred outcome, this will simply make de jure what was de facto prior to 2003, when filibusters were virtually never used on the executive calendar,” Flake said in a prepared statement after Thursday’s votes. 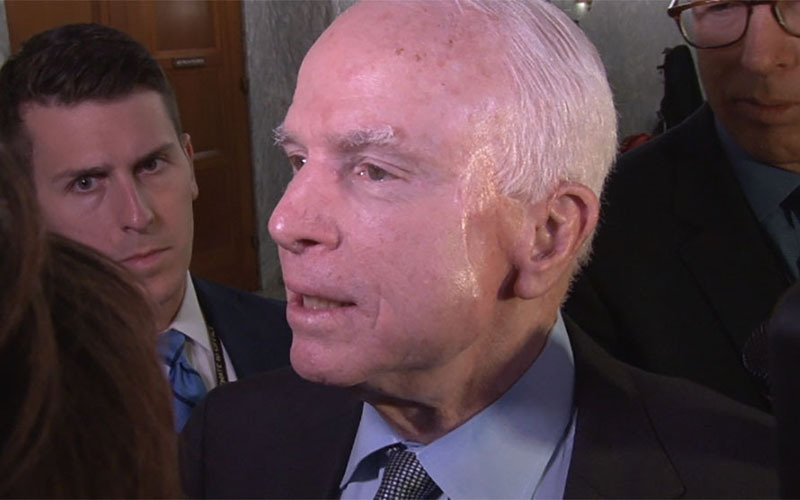 McCain called the nuclear option “a regrettable setback for the institution of the United States Senate,” but said in a statement that Democrats who filibustered the confirmation process are to blame. “Today, the Democrats chose to filibuster the nomination of a world-class jurist with the experience, knowledge, and judicial temperament to serve with honor and distinction on the nation’s highest court,” he said. “I think it’s the culmination of a procedural arms race in the U.S. Senate where, over time, presidential nominations in general have become partisan flash points,” said Kyle Kondik, managing editor of politics newsletter Sabato’s Crystal Ball at the University of Virginia Center for Politics. Although the votes Thursday only impacted one application of the filibuster, Georgetown University government professor Stephen Wayne said it could be a harbinger of the procedure’s end altogether as the party divide deepens. But Kondik said that it could benefit Democrats in the long run. Democratic presidents have tended to nominate less-ideological nominees than Republicans in the past, he said, but that could now change. “At some point, the Democrats are going to be able to get a more liberal nominee in the court than they otherwise would have gotten,” Kondik said. Gutierrez said that, with Democrats essentially out of options to stop the Gorsuch confirmation, the state party will focus on publicizing Flake’s Thursday votes as his 2018 re-election campaign nears. But Democrats already have their work cut out for them in Arizona, where they have a registration disadvantage. The chances of unseating a Republican incumbent based on Senate arcana is unlikely, Kondik said. “I don’t think a procedural vote in the Senate is going to make much of a difference in a midterm 18 months from now,” he said. – Cronkite News reporter Ziyi Zeng contributed to this report.